Featured / Recipes / 28.04.2018. Spring is an ideal time for preparing meals with self-grown plants. 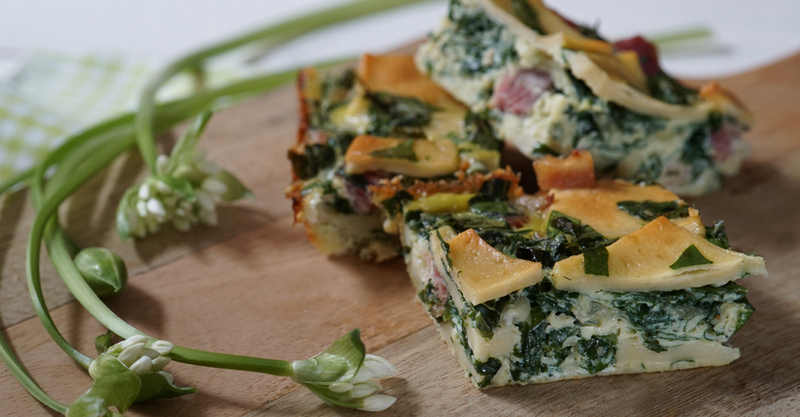 Traditional meal made of square noodles, eggs, bacon and wild garlic is an ideal as a simple dish, but also an interesting idea if you are preparing small snacks for your guests. Sieve the flour into a wide bowl and add salt. Make a dimple in the middle of the flour and place an egg in it. Start mixing the pastry with a fork until it binds a bit, and then continue with your hand. Move the pastry onto a floured surface and knead for about 10 minutes until you get smooth and firm pastry. Roll the pastry thinly. Cut it in wide horizontal and then vertical stripes in order to get larger squares. Cook the pasta in salted water and strain well. Chop the onions and fry them on oil, let cool. Mix the chopped wild garlic leaves with boiled pasta, fried onion, cubed bacon and stirred eggs. Add salt and pepper and mix it all together well. Place the mixture into a smaller baking dish, oiled and covered with breadcrumbs. Place in an oven previously heated to 180 °C and bake for about 40-50 minutes, until crunchy crust is formed. Slice in cubes and serve warm with fresh season salad. If you are using ready-made noodles, you would need about 150 g.